Watching Signatures, the sophomore effort from Colorado-based film company Sweetgrass Productions, I found myself initially asking, will anyone get this? And then, as the film's ever-surprising moments of unforgettable beauty overwhelmed me, I wondered if anyone could possibly not love this film. Signatures is a film about skiing and snowboarding. I will not call it a 'ski film'—to do so is to compare apples and oranges. In contrast to the annual crop of enthusiastic but repetitive stoke films that arrive every Fall, Signatures eschews nearly all the conventions of the genre. It is instead an example of traditional and deeply heartfelt filmmaking in which artistry and craftsmanship of the highest order come together. Much of the pleasure of this film comes from its unexpectedness—its ability to surprise, stun, and delight. Be warned that these surprises are not accomplished via feats of cutting-edge athletic prowess or death-defying daring. The film's power arises instead from its often-magical ability to capture fleeting and poetic moments of the rhythms of life. Be aware also that Signatures is narrated entirely in subtitled Japanese—there is no English. The film was shot in Hokaido, Japan, on mountains that must be blessed with some of the deepest snow on Earth. The narration, however, is one of the film's strengths—and I will leave it at that. I also loved the soundtrack. Folksy and acoustic, it struck me as flawlessly chosen. Another, more obvious strength is the photography. Photography alone makes Signatures unforgettable. Yet here too, the film defies convention. Skiing, in fact, doesn't even appear until over four minutes into the film. I will swear, however, that when that first image of a skier floating through bottomless powder appeared, I felt my heart skip. 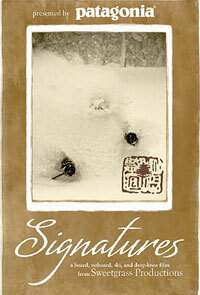 In Signatures, the air is ever-alive with glittering flakes of snow that breathe texture and life into the images. But this is a four-season film, with vivid images of spring blossoms and ocean waves to contrast Japan's snowy mountains. And my favorite shot in the entire piece takes place indoors, as a child watches her father shape a snowboard from wood, by hand. Allow me to note that Signatures was my introduction to the sport of "NoBoarding". On this subject I will say only this: like much of the film's surprises, NoBoarding was for me love at first sight. What will Signatures mean to you? I can't say. The pace is contemplative from start to finish—hardly the fast-cut shots of edges cliffs and boards we've come to expect. Inevitably, some will be bored by it. But something caught low in my throat as I watched this remarkable film, and I'm not sure the feeling is ever going to go completely away. If you are open to something a little different, who knows? You just might find a little magic mixed with love that will stick with you, too. I'd say that's a chance worth taking. 'Signatures' opens September 19, 2009 at the Wheeler Opera House in Aspen. For more Tour dates & locations, including California and Arizona, visit Sweetgrass Productions. You can also purchase DVDs and BluRay disks directly from Sweetgrass.